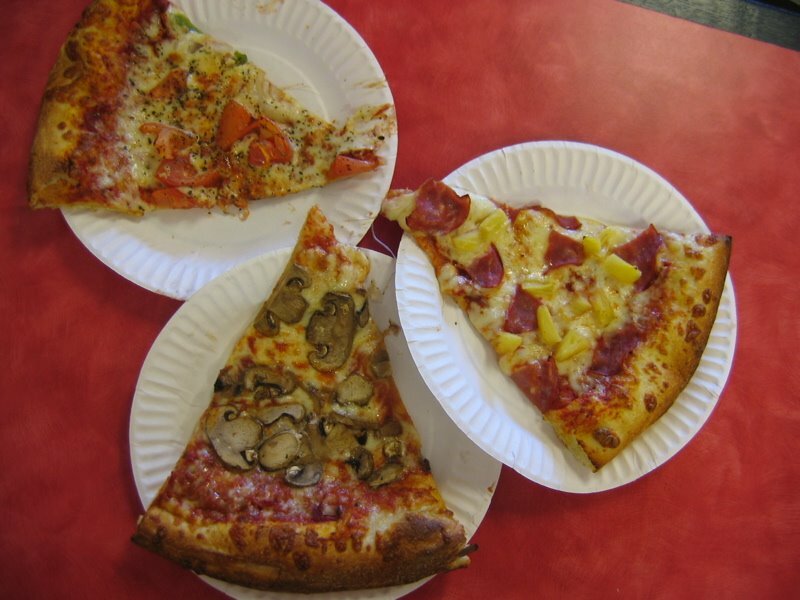 Standout Tidbit: “10 Varieties Available by the Slice Daily!” Other locations back East in New Hampshire. 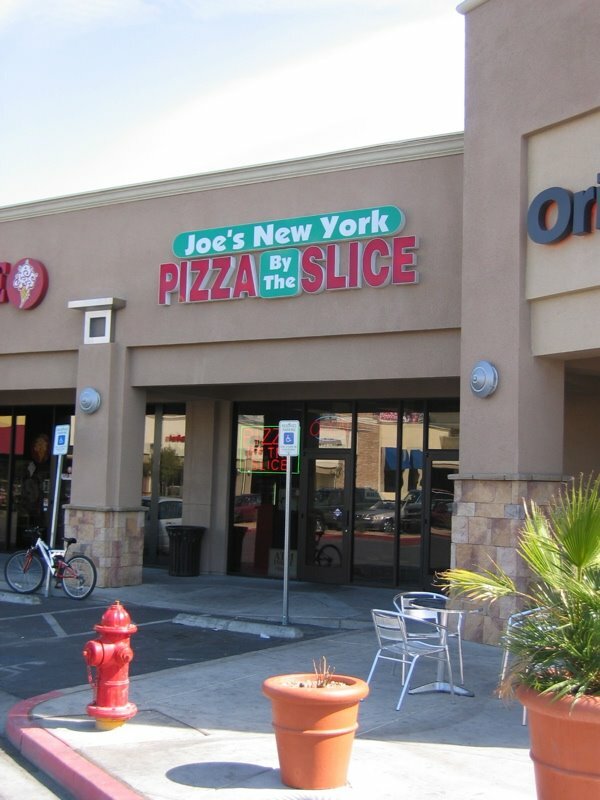 Review: Joe’s was the first pizza place we hit after landing in Vegas. It was easy to find as it is across from the Hard Rock Hotel & Casino on Paradise Road. We arrived a little after 11am and this counter-style establishment was clean (including the bathrooms), the staff was friendly, and the glass display case on the counter was packed with a good variety of seemingly fresh pies for slices. 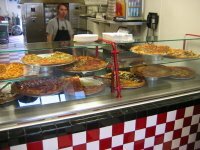 They claim to offer “10 different pizza slices available each day” for their “No Delay Lunch.” The menu also offers salads, “monster calzones”, and more than a dozen “specialty” pies, including 2 white pizzas and no less than 5 pizzas with chicken. The sizes of pies range from 12” up to 19”. Even though we were pretty hungry, we only ordered one slice each. We knew we would be going to another restaurant after picking up another member of the group at the airport an hour and a half later. 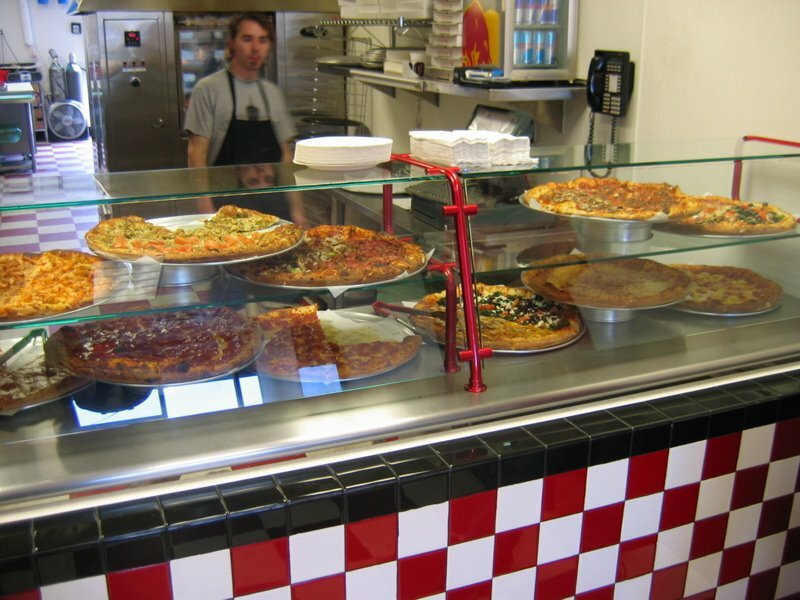 After ordering, our slices were placed on screens and slipped into the rotating carousel pizza oven for re-heating. 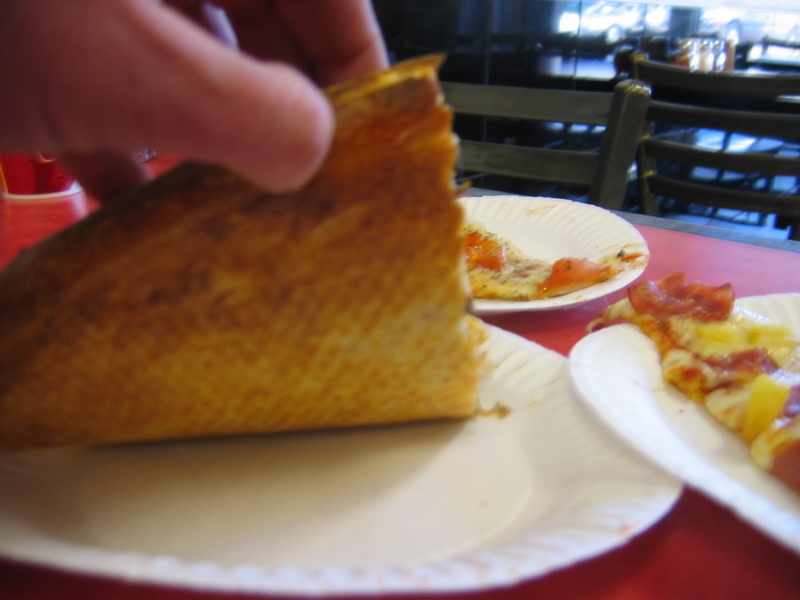 Joe’s slices are quite thin and foldable, although not as large as I usually expect from a NY-style counter joint. We found the cheese to be tasty, not-too-salty, and only slightly greasy, which is fine by me. The veggie toppings were fresh (mushrooms, tomatoes, garlic), and my brother seemed to like his ham and pineapple slice quite a bit. The take-out menu states their sauce and dough are made fresh every day. The sauce was flavorful with nice herbs that don’t overpower the tomatoes. The subtly–flavored crust seemed nicely-browned, crispy outside, and soft and chewy inside with some decent bubble holes within. 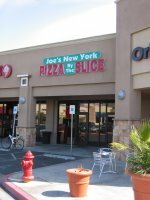 We left Joe’s on our first morning in Vegas feeling we had just eaten some pretty good pizza. If that had been our lunch, instead of a pre-lunch snack, we might have been a little grumpy about the size. But, for now, we were good. We stopped by Joe’s again on our way to the airport 3 days later. It was about 3:30 in the afternoon and we found the choices quite a bit scarcer as far as slices went. There were nowhere near 10 options available. We also thought they seemed a little dryer, which would make sense if they had been sitting out for a bit. This visit, we were troubled by the fact that some of the slices had a HUGE lip that would encroach up to 2 inches into the pie. I half wondered if they had run out of ingredients and made a 12” za on a 19” crust. Our overall impression after two visits was that the pizza was tasty, but a little inconsistent as far as the execution goes. This entry was posted in Good, New York-Style, Thin Crust and tagged Good, New York-Style Thin Crust. Bookmark the permalink.